The Economic and Financial Crimes Commission, EFCC arraigned Leeroy Egebe, (alias Amedeo Dante William, Alhassan Davide) before Justice E. A. Obile of the Federal High Court, sitting in Warri, Delta State. He was arrested on an on an 8-count charge bordering on conspiracy and obtaining money from a Swiss woman by false pretence to the tune of $18,023.96 (Eighteen Thousand, Twenty- Three Hundred Dollars, Ninety- Six Cent. 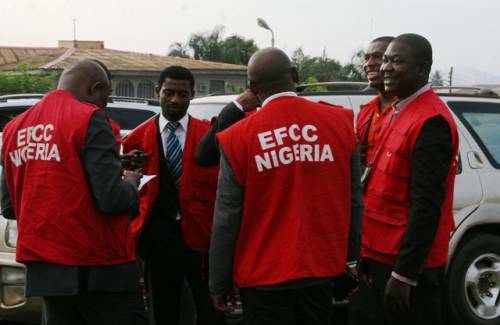 Egebe’s troubles began when one Vivian Varotto-Guigoz, a citizen of Switzerland, petitioned the EFCC alleging that she met one Amedeo William Dante (the defendant) who claimed to be an Italian living in the United Kingdom on a social dating site called “Badoo”. They became lovers, exchanging emotions and later cash. She alleged that on several occasions, between 12 May and 14 October 2015, she wired a total sum of CHF 196,701,44 and EUR 15, 957.43 to different individuals in the United Kingdom, Canada and Nigeria at the request of Dante, for sundry reasons which she later discovered to be fraudulent. The payments were allegedly made in five instalments: two into British accounts belonging to Amedeo William Dante and Dittimi Tamara-Finide while three were made into Nigerian accounts belonging to Alhassan Davide and Edin Obaro. The petitioner also alleged that the defendant was reaching her through some English, Canadian and Nigerian telephone numbers. The defendant pleaded not guilty to the charges when they were read to him. In view of his pleas, the prosecution counsel, M. T. Iko asked the court to fix a date for the commencement of trial. However, counsel to the defendant, K. D Alufe, made an oral application for bail for his client. He argued that the alleged offences were bailable and that the defendant did not jump an earlier administrative bail by the prosecution. In his ruling, Justice Obile granted the defendant bail in the sum of N3, 000,000.00 (Three Million Naira), one surety in like sum. The surety must be a public servant in the service of Federal or Delta state government on grade level 12 and above. The defendant and the surety must depose to an affidavit of means among other conditions. The matter was adjourned to 10 May 2018 for trial, while the defendant was remanded in prison custody pending the perfection of his bail conditions.